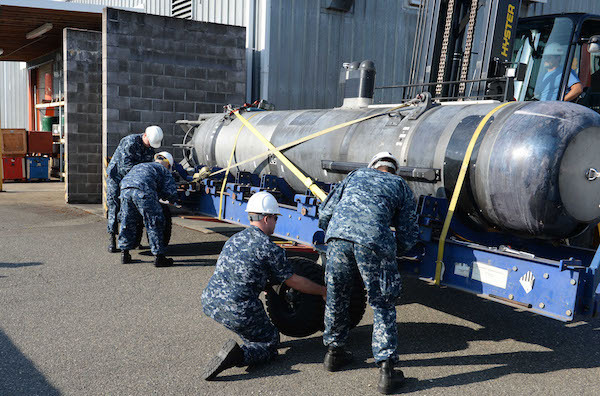 KEYPORT, Wash. --- Commander, Submarine Development Squadron 5 (CSDS 5), Detachment UUV, took delivery of Large Training Vehicle 38 (LTV 38), an unmanned undersea vehicle (UUV) Aug. 22. The delivery makes LTV 38 the first UUV to join the vehicle inventory used by detachment UUV at Naval Undersea Warfare Center Keyport. Once a few final operational preparations are completed over the next few weeks, it will be ready to hit the water for both capabilities tests and proficiency training. "This is certainly a key milestone for Detachment UUV in that we will have a baseline training vehicle for the future of Large Displacement UUVs," said Lt. Brian Nuss, officer in charge at Detachment UUV. LTV 38 was originally developed for the Sea Stalker program. The vehicle is 27 feet in length and 38 inches in diameter, and was originally assembled in 2008 by Penn State University's UUV land-based test facility at State College, Pennsylvania. It underwent its first series of operational tests shortly after its assembly and made its first operational deployment on the Arleigh Burke-class destroyer USS Bainbridge (DDG 96). "This process was a long time coming," said Sonar Technician (Submarines) 1st Class (SS/DSV) Travis Townsend, leading petty officer at detachment UUV. "Puget Sound has a great undersea and naval presence. It truly makes sense for the detachment to receive this vehicle and start preparing for what the future of the Navy holds." UUVs allow naval submarines to safely gain access to denied areas with revolutionary sensors and weapons. These areas may be denied based on unacceptable risks to a submarine such as extremely shallow water, very poor acoustic conditions, or mined waters. UUVs provide unique capabilities and extend the "reach" of naval platforms while reducing the risk to the submarine and its crew. The use of unmanned vehicles in the undersea environment is projected to grow for the Navy. During a recent visit to the Pacific Northwest, Chief of Naval Operations, Adm. Jonathan Greenert, told Sailors he envisions having autonomous underwater vehicles on patrol by the end of the decade. "The future large-diameter vehicles will come in 2020 and in order for the detachment to fully prepare for the delivery of those vehicles we have to start with the tactics, training and procedures now to make it a successful program in the future," Nuss said. According to the Penn State University Applied Research Lab, the Pacific Northwest provides key components for efficient transition of UUV technology to the fleet that includes technology development, testing and evaluation, and fleet presence. "We couldn't have done this without the partnership from Keyport, Penn State and Commander, Submarine Force Pacific, supporting us both financially and realizing that there's a gap in training that needs to be filled for Det. UUV to succeed in the future," said Nuss.